Chesterfield fell to their lowest table position of the season, 14th, after their 0-0 draw at struggling Crewe. Paul Cook’s side, back to 4-2-3-1, played with fluidity and purpose, creating the best and most chances, but they were unable to convert dominance into goals and had to settle with a second straight League One goalless game. Austrian defender Georg Margreitter could be fit after his hamstring strain. Cook said: “In the first half I thought we were really good. We started the game well, we created a lot of chances and we know we’ve got to start putting them away. 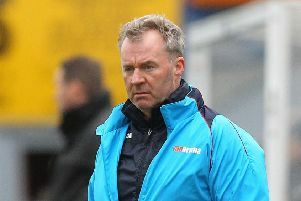 “Crewe came into the game in the second half and it became more end to end, but we shaded the game. We possibly deserved to win. We know we need to score more goals and we’re working hard on that.